Your business files in the Cloud and at your fingertips. Any file type anywhere. There are several different ways My Docs Online (MDO) can be used for Online Document Management, but they all typically involve the following seven important components. Customers using our service for document management purposes usually focus on one of two main approaches – using MDO as a repository, or using our sharing and collaboration tools. One example of document repository use is by real estate firms, who typically scan important documents for each property as they are created, and organize them in their account by property address, thus allowing quick and convenient access to all documents related to a property, by agents, buyers, sellers, attorneys, etc. 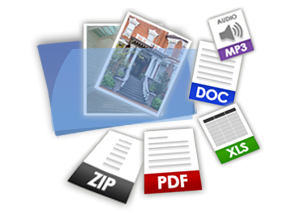 Scanned documents can be uploaded through a variety of means, including email attachment or WebDAV support built into a high-end scanner or multi-purpose scanner/copier, or via tools like our MDO Desktop App, which can upload entire “folder trees” from a PC or Mac conveniently and quickly. When the focus is on sharing and collaboration the files are best saved as Microsoft Office (Word and Excel) files, which makes them editable once online using the MDO Desktop App or web folders. The same upload tools can be used to get the documents online initially. Once a file has been uploaded to any My Docs Online account it is stored in three separate locations on three separate file servers, to guard against interruption in document availability in the case of a hardware failure. Files are in a shared, pooled storage, so that a file takes up the same amount of account storage quota regardless of how many users can access it. Users can be defined as having “View Only” access so that they can download a document but not edit, rename or delete it. Another option is to give “Full Control” so users can edit documents, rename documents, share or upload documents or new folders. Administrators set permissions to grant Users the rights to folders which a they may access and retrieve. Universal distribution is easiest when a document is converted to an Adobe Acrobat PDF file before upload, as virtually all recipients will be able to open and view a PDF file. Using the PDF format also provides the most control over reliable formatting regardless of the recipient’s hardware and software. ALL files in a My Docs Online account are stored and transferred securely, including file and folders uploaded to an account for document management purposed. The My Docs Online Desktop App supports File Locking for files of ALL types, including Microsoft Office files. For Office files (Word and Excel) Web Folders is an additional enabling technology, offering viewing and accessing using familiar Windows or Mac methods. File locking during update is included. Administrators can use the file search and undelete feature included in Group Administration. Searching is also possible using Web Folders. All users can use the built-in search feature of the Desktop App.